It’s that season. You know the one I mean. Not Autumn. Pumpkin Spice Season. There is more to fall than pumpkin spice. 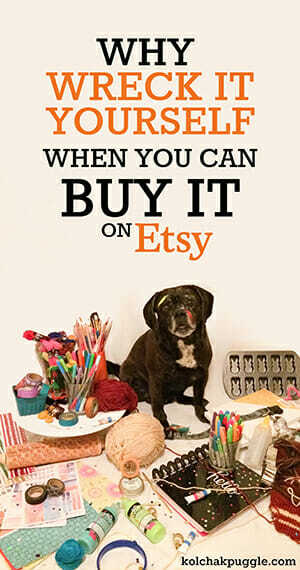 And if you happen to be a dog lover? Pumpkin spice can be dangerous for your dog. One of the main ingredients in pumpkin spice, nutmeg, is incredibly toxic to dogs, the worst effects being tremors, seizures, convulsions or death. I cringe every single time I see a dog treat recipe for “Pumpkin Spice” because even if that recipe only has cinnamon? What if people miss that and use a pre-made pumpkin spice mix or think they can share a human PSL treats with their dog? It doesn’t take a ton of nutmeg to be hazardous (as little as 2 tsp. in humans). The risk just ins’t worth it to me. Say no to doggy Pumpkin Spice. So in the spirit of sharing some seasonal snacks with your pet that won’t make them sick, we’re talking about our favourite fall flavors you can share with your dog. Apples – Apples are one of the stars of fall. If you live anywhere in orchard country, you can find any number of local apple strains that are crisp, delicious and totally dog friendly. Always wash apples carefully to remove any chemicals or pesticides on the skin and cut out the core and any seeds, then share this fresh, flavourful fruit with your dog. Serve them fresh or check out our apple dog treat recipes. Beets – These rich, earthly flavoured vegetables are absolutely dog friendly and they are freshest and at their best in the Fall. Fun story, the first time I fed my dogs beets, I forgot to tell the Daddy. He took them for a walk and was so worried he took them to the vet because their poop was red. WHOOPS! My bad. I love beets, hot or cold, and now that my dogs recognize the smell, they beg for a taste of their own. I love making this dog-friendly roast beet, quinoa and goat cheese salad and sneaking the dogs bites off my plate. Kale – Don’t throw hot garbage at me! I know. Calling kale “delicious” in controversial, but my dogs and I LOVE IT. EatSmart makes this bagged sweet kale salad with brussels sprouts, cabbage, broccoli and chicory and Kolchak will actually eat a whole (dressing-free) bowl of it. We all think kale is really tasty, but if you don’t think you’re dogs are down for a bowl of it try these Turkey and Kale DIY Dog Treats or these Kale Chips. Cranberries – These tart, bite sized berries are full of antioxidants for pets and their people. 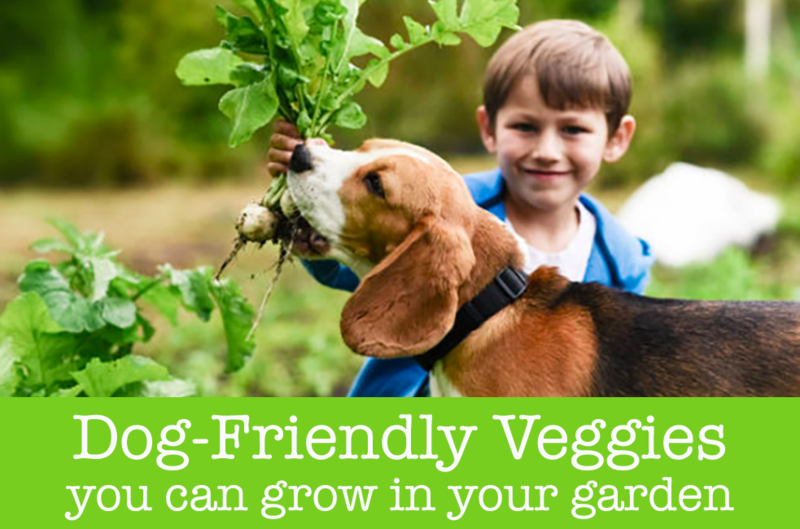 You might have a hard time convincing your dog to eat them plain, but they make a tasty addition to other flavours like sweet potato and turkey. Try incorporating the bright flavours of cranberry into your dog’s diet with our Thumbprint cookies or Thanksgiving Jerky Treats. Squash – While all the world is shouting their pumpkin-based love affair from the rooftops, I’m a secret admirer of the other members of the squash family. Butternut squash is my favourite and a staple at Casa de Kolchak. Anywhere you use pumpkin, you can use squash. (Just steer clear of kabocha squash and decorative gourds which have some anecdotal evidence to suggest they may not be fully dog safe.) Try our Autumn Gold squash dog treat recipe or this baked apple and squash dish that you and your dogs can share. Pears – I love a pear. Juicy, fresh and so flavourful, pears are one of my favourite things to eat in the fall, so it’s only natural that my dogs enjoy them too. Just like with apples, you want to wash them well and remove the core and all the pips. Try them anywhere you would usually use apple, in a coconut dog treat or (my fav) on top of dog-friendly pancakes. Sweet Potato – Oh sweet potato, how much do I love thee? Let the count the ways. I love sweet potato roasted and mashed and in baked goods and in soups. I love the warmth and richness it brings to fall food. It’s also a darn staple of the dog treat works and there are SO MANY WAYS you can use sweet potato in dog treats. Broccoli and Cauliflower – OK, so these are two separate things, but I’m listing them together because they are both dog friendly and pair PERFECTLY with one of my dog’s main obsessions: cheese. No need to do anything fancy, I just steam these babies, sprinkle a little shredded cheese on top and watch the dogs (and humans) go wild. If you’ve read all this and you’re still all #TeamPSL, well, you do you, boo. 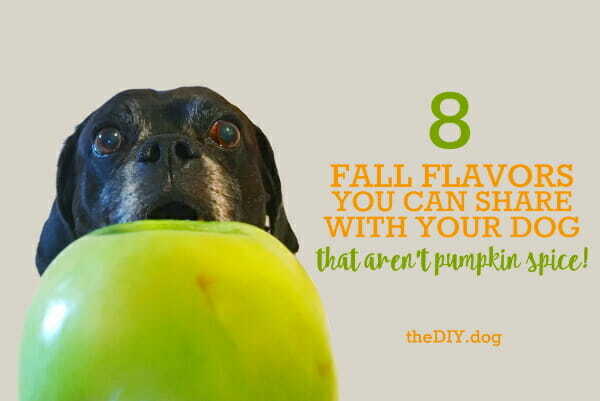 I think you’re missing out on SO MANY awesome, dog friendly Fall flavours. You can make delicious dog treat recipes with pumpkin, but they aren’t by far the only dog friendly fall flavour. What is your favourite fall fruit or vegetable? 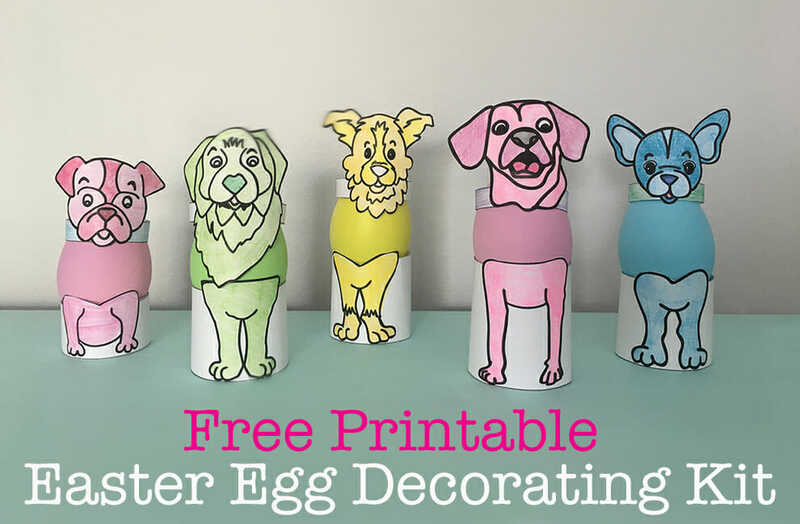 Is it dog friendly and what do you make with it? With the exception of beets, I LOVE every single one of these fall fruits and veggies. I tend to eat most of them all year long. 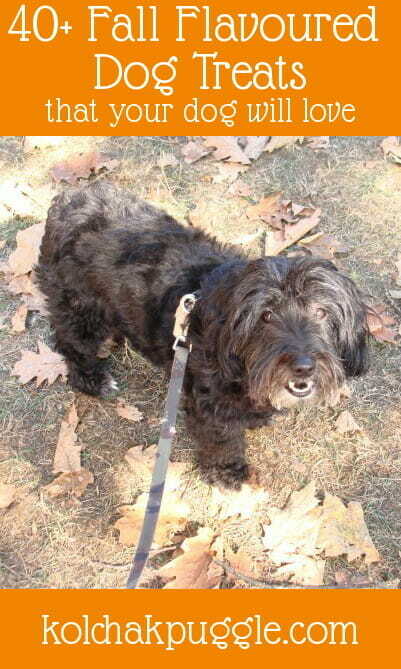 We also usually do some apple picking in the fall – and I never thought to bring Ruby, but maybe we will this year. Ruby loves sweet potatoes and apples. I didn’t actually know nutmeg was toxic to dogs. I am also a huge fan of pumpkin spice – especially when there is pie involved. HOW CAN YOU NOT LOVE BEETS, YOU MONSTER? Ohmigoodness, they are one of my very favourite foods. I would love to take the dogs apple picking but I don’t think any of the orchards by my house are dog friendly. If you go, I hope you take lots of pictures. We do use cinnamon here, mostly because studies show that cinnamon toxicity generally occurs when a high dose is consumed consistently over time and not in a single accident, as could be the case with nutmeg. That said, we do try to use quality Ceylon cinnamon which has significantly less coumarin in it than Vietnamese, Indonesian or Cassia cinnamon. I didn’t know about Nutmeg… I’m glad I haven’t tried it before. You have listed amazing recipes. They ALL sound fabulous and you have quite a collection. Thank you for sharing! I’m a nutmeg fiend and love it as a flavour for myself, but I’m very cautious about making sure the dogs don’t get a hold of it. And thank you! I love good fresh food and so do my pups! Technically nutmeg is toxic to human beings also. That means you and everyone else reading this – nutmeg is literally poisonous to you. Have you or I ever died from it? Considering I don’t think anyone here is a zombie I can hazard a guess as to the fact everyone reading this is still alive. Has it ever made people sick? Yup. Dosage and moderation is the key in MANY spices. Fear mongering is annoying at worst and dangerous at best. Presenting factual data supported by science or case study reports is the only thing that should be shared and written about when concerning things that are allegedly dangerous. I cringe every time I read an article that presents no actual useful information or data to the reader. If people can’t site sources or do research before writing, they should flat out stop. Case in point broccoli and cauliflower ARE the same thing. Literally the same thing, they are both Brassica oleracea, the exact same species. They are different cultivars and that is all. Please do more research and present more data on future writing. Salty is not just a clever name, eh? Thanks for dropping by and sharing your opinion. The toxic dose of nutmeg to human is considered to be 2-3 teaspoons, an amount that would be difficult to consume in a single sitting. (Source: Poisoning & Drug Overdose 5th edition) While there have not been enough good studies to determine exact toxicity levels in pets, the vets I have spoken suggest using a dog’s weight to determine a general idea of toxic dosing. By that method, as little as a 1/2 tsp. could potentially be considered lethal to the dogs in my home. Smaller doses are likely to cause severe digestive distress. Cinnamon, while having the potential to be toxic as well, is not considered to be as potent and is generally toxic when consuming high doses over time, like a supplement. This is why nutmeg is included on most pet poison lists and cinnamon is not. In fact, in searching dozens of pet poison lists marketed by veterinary professionals and experts, not one listed cinnamon as a potential lethal poison, but all mentioned nutmeg. It is up to every pet owner to decide if the risks are worth it to them, but I think I’ll stick with the veterinary community on this one. I don’t think that’s fear mongering as much as it is responsible pet ownership, so we’ll have to agree to disagree. I cringe when people misuse the word “literally”. While you’re right that broccoli and cauliflower are pretty similar, Oxford dictionary defines the word same as “identical; not different”. They may have started as the same plant, (along with cabbage, kale and brussels sprouts to name a few) selective breeding over the years means they are no longer identical. They even have different nutritional profiles, growing cycles and growing methods. It’s a neat bit of food science, but it doesn’t make referring to the cultivars as different incorrect. 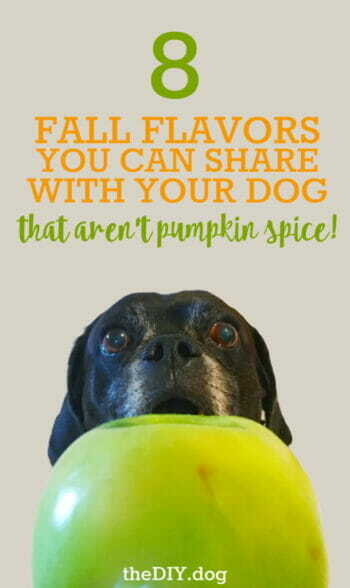 I’m a pumpkin loving dog, but I like it straight up, no spice!